Free Form® SCULPT is a two part sculpt-able epoxy clay that requires no firing and will self-cure in a short time to an extremely hard and durable state with virtually no shrinkage. SCULPT is 30% lighter than similar products and holds vertical surfaces better. Users can sculpt larger, stronger pieces with more control over weight distribution. Free Form SCULPT has an ultra fine particle size that gives the user the ability to sculpt finer detail with better precision using tools or shaping by hand. A mirror-like, gloss finish can be achieved by smoothing SCULPT with water before it cures. Maximum Usability - Just Add Water; you can change the consistency and workability of Free Form® SCULPT by adding water when mixing A+B components. Putty surface can be smoothed with water while sculpting. Safety – Use in a properly ventilated area (“room size” ventilation). Wear safety glasses, long sleeves and rubber gloves to minimize contamination risk. Wear disposeable gloves. Use of a NIOSH approved respirator is recommended. Preparation – Materials should be stored and used in at room temperature (73° F / 23° C). Mixing should be done in a wellventilated area. Because no two applications are quite the same, a small test application to determine suitability for your project is recommended if performance of this material is in question. This product is mixed by hand. You must wear disposable gloves when mixing this material. Measuring - Free Form® SCULPT putty comes as two parts. 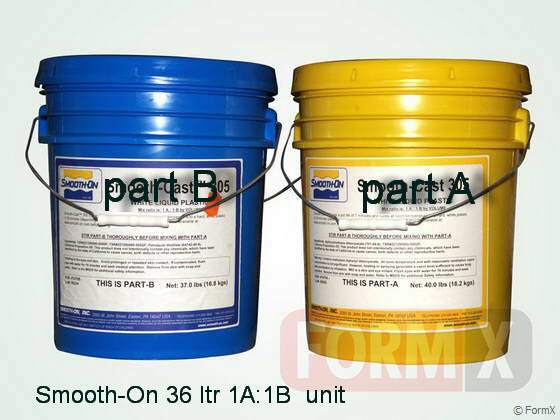 Dispense equal amounts (golf ball size, for example) of Part A and Part B.
Mixing - Knead parts together aggressively to a uniform color and apply to surface. Immersing in water periodically will make Free Form® SCULPT more workable. Pot Life/Working Time - This material is mass sensitive. The more material you mix at one time, the less time you have to work with it. Working tip; If mixing a large quantity, flatten putty with a rolling pin to reduce mass concentration and extend pot life. Applying – Mixed Free Form® SCULPT is a dough that can be applied up to 2.5” (6.35 cm) thickness. Pot Life and Cure Time values are dependent on mass and ambient temperature. The greater the mass, the shorter the working time. Shrinkage will also be higher. Free Form® SCULPT will gradually stiffen during its working life, changing its pliability. Add water periodically using a spray bottle to improve workability. It will be most adhesive within the first 30 minutes. Use as a Sculpting Medium - Free Form® SCULPT can be applied to wire mesh armatures to create rigid forms for sculpting. Wire mesh for sculpting is available at most art supply stores. If making a large sculpture, work in small sections and apply in layers to build up a suitable thickness. Putty can be rolled out between two sheets of wax-paper using a rolling pin. Knead new sections with your fingers to bond the edges. Smooth surface of putty with water. Use water to keep sculpting tools from sticking to putty. While Sculpting - Using a water misting spray bottle, mist water onto putty surface to maintain workability. To Sculpt Fine Detail and Add Texture – Allow water to evaporate slightly. 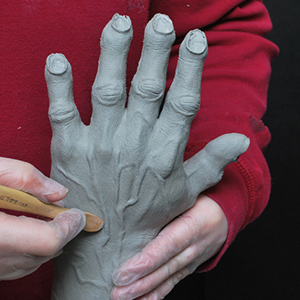 Putty will stiffen and allow sculpting of fine detail. Curing - Free Form® SCULPT will reach full properties after 24 hours at room temperature. Cured epoxy is waterproof and can be sanded or machined. If machining or sanding, wear NIOSH approved particulate mask to prevent inhalation of particles. Painting – Cured Free Form® SCULPT can be primed and painted with acrylic enamel paints. Let paint fully dry before handling. Heat Resistance – Fully cured putty with a minimum thickness of ½” (1.27 cm) will resist temperatures up to 150° F / 65° C.
Removing Uncured Free Form® SCULPT - Remove as much uncured material from the surface as possible. Clean any residue with soap and water. Optional - Use E-POX-EE KLEENER® available from Smooth-On. Shelf Life - In an unopened container, at 73° F / 23° C, shelf life is 2 years. Use entire contents as soon as possible after opening.